The Penguins managed to stay afloat in the 10 games that Evgeni Malkin missed, but not much more than that, just barely topping 0.500 with a 5-4-1 record. They've managed to hang on to a playoff spot, but they'll need to start winning games to keep pace in the division. They should have an easier time of it with Malkin and Bonino back in the lineup, and they get a chance to ease back into action as the Penguins take on the Winnipeg Jets, the last place team in the Central Division. It's the second and final game of the season between these two teams after the Jets won a snoozer in late December 1-0. This will be the second game for the Jets since they traded captain Andrew Ladd back to the Blackhawks on Thursday, getting Marko Dano, a 2016 1st round pick, and a 2018 conditional 3rd round pick while also sending Jay Harrison and Matt Fraser back the to Chicago. The team was unable to come close on a contract extension with Ladd, and in Dano they get a player who was a key piece of this past summer's Brandon Saad blockbuster. The 21-year-old former 1st rounder had 21 points in 35 games last season with the Blue Jackets but wasn't able to make quite the same impact on a deeper Chicago team, scoring just a goal and an assist this year with the Blackhawks. Still, Dano and the 1st round pick give Winnipeg some pieces for the future. A big part of the reason why the Jets were unable to come to terms with Ladd on an extension is because they had just handed one out to Dustin Byfuglien. Winnipeg signed Byfuglien to a 5 year, $38 million extension with a $7.6 million AAV, and with needing to re-sign younger RFAs like Jacob Trouba and Mark Scheifele in the offseason the cap space just wasn't there. But Kevin Cheveldayoff clearly kept the right player, as Byfuglien's presence on the blue line is invaluable, and Ladd plays a taxing brand of hockey that has already seen the 30-year-old's game start to decline this season. 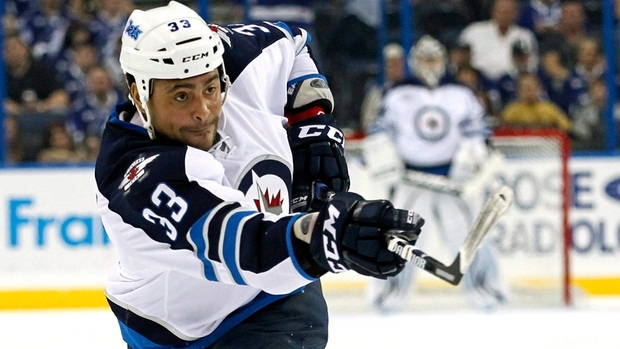 Byfuglien continues to be a force for the Jets, and with 15 goals and 23 assists he continues to be one of the better scoring defensemen in the league and a great driver of possession from the blueline. Up front, the the first line tandem of Blake Wheeler and Bryan Little continues to lead the way for the Jets. Wheeler has developed into one of the better wingers in the league since coming over from Boston in a deadline deal that the Winnipeg franchise has won handedly. He's currently 9th in scoring with 17 goals and 39 assists, and his 0.93 points per game has him on pace to best his previous high of 69 points that he scored in 2013-14. Little is currently second on the team with 42 points, but he's been shut down for the season with a fractured vertebrae. The injury to Little could be a blessing in disguise for the Jets, as they're currently just 5 points ahead of Edmonton for last place in the league. Removing Little and Ladd from the lineup takes away two of their bigger scoring threats. With nothing to play for, the trade and injury gives Winnipeg a better chance to improve their draft stock. It also gives them a chance to see how Scheifele handles responds to top line minutes. The 7th overall pick of the 2011 draft has posted a 0.60 points per game average in his three full seasons in Winnipeg, including 15 goals and 19 assists in 49 games this season, and he's responded to the extra ice time with 2 goals and 3 assists in the 3 games that Little has missed, including a 4 point effort Thursday night in Dallas. - Evgeni Malkin and Nick Bonino will return to the lineup for the Penguins, and it will be a boost to a Pittsburgh team that can use the additional depth in their lineup. Bonino will play his first game after missing 17 with a hand injury, and Malkin will return after 10 out with a lower body injury. The Pens will hope that Malkin can provide a spark to their slumping power play, which has gone just 1-for-24 (4.2%) in his absence. - The NHL trade dealine is this upcoming Monday, and indications are that Jim Rutherford will be looking to add to his team. Another move that he might be looking to make is trading Sergei Plotnikov. Plotnikov has been a healthy scratch for 19 straight games after falling out of favor with Mike Sullivan, and his preference will be to catch on with another NHL team, though the Russian has returning to the KHL to fall back on.